Global Thermoplastic Polyolefins Market size was valued at over USD 2 billion and is expected to witness over 6% CAGR by 2023. Increasing demand from end use industries such as aerospace, automotive, construction and medical will boost thermoplastic polyolefins market size. Trend to replace polyvinyl chloride with TPO across various sectors owing to rising environmental concerns will fuel market growth. Demand will also be supported by advancements in terms of functionalities such as durability, economical, lightweight, admirable abrasion resistant, UV light stabilizer & antioxidants to resist solar UV radiation and oxidation. It holds properties of both plastic and rubber. It is preferred in regions of extreme weather conditions as it protects the metal and non-metal parts exposed to severe heat. 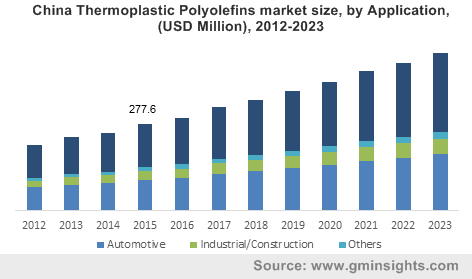 Rapid development in automotive sector in countries like India, Brazil, and China is expected to drive the thermoplastic polyolefins market growth over the forecast period. In automotive marketplace, the product is utilized in making door panels, air dams and fender flares. They are preferred over elastomers and other polymers due to their ease of processing, greater design freedom, light weight and ability to be recycled. Growth in construction output tends to contribute towards thermoplastic polyolefins industry demand as it finds applications in commercial & residential roofing. This can be attributed to its properties like weathering resistance and cold temperature flexibility. TPO roofing systems provide vital reflectivity and energy efficiency well as strong resistance to ultraviolet radiations. Hence usage of TPO in roofing systems reduces the heat gains of building. Propylene and ethylene are two key products in the polymers industry. Instability in crude oil price in the coming years due to political instability may impact thermoplastic polyolefins market price trend. In 2015, ethylene witnessed a strong price increase despite of reduction in crude oil price. This can be due to tightening supply demand scenario owing to the robust demand from petrochemical products. Rubber and reinforcing polymers are also used in manufacturing of TPO process. Industrial thermoplastic polyolefins market segment will witness CAGR over 5% up to 2023. Rapid industrialization coupled with increased per capita disposable income of customers have positively influenced end se industries such as automotive and construction. Automotive manufacturing is a key industry consumer and is estimated to account for more than 65% of the total industry share by 2023. Major automotive component manufacturers include Germany, Japan south Korea followed by Mexico. Mexico is on verge of replacing Japan to become the number 2 supplier of motor vehicles to the North American market. Additionally, major automotive manufacturers like Kia, Audi, American ford have already announced plans to construction production plants in Mexico. Other applications include wire & cables (used in electrical equipment’s like TV, Refrigerators, Guizers), batteries, of plugs, switches, window frames, and piping system. Growth of automotive industry in Asia Pacific countries will favor the thermoplastic polyolefins market size which is expected to surpass USD 1.1 billion by 2023. Use of TPO leads to the reduction in overall weight of vehicles which increased the fuel efficiency of vehicle and helps to control the CO2 emission. India and China TPOmarket together is forecast to exceed USD 600 million by 2023. U.S. is expected to dominate the North America thermoplastic polyolefins market size throughout the forecast timeframe. Industrial & construction applications are likely to be the fastest growing segment in the region over 6.5% growth by 2023.Futhermore strict automotive fuel efficiency regulation will be good for industry evolution. Due to the use of thermoplastic polyolefin in automotive sector, it increases the fuel efficiency by reducing overall weight of the vehicle. Europe thermoplastic polyolefins market is predicted to experience gains over 4.5% during the forecast timeframe. Increased application scope in automotive industry of Germany which is a manufacturing hub for top automotive OEMs like Mercedes Benz, Audi, BMW play a significant role of lifting the global market. TPO market share is highly competitive in nature with Dow Chemical, Arkema S.A, A. Schulman, Sumitomo Chemical, and ExxonMobil being the key industry participants. Other industry players include DuPont, SABIC, Mitsui, INOES, Saudi Aramco, GAF, LyondellBasell, Spartech, S&E Specialty polymers, Noble polymers, Polisystem UK, and RTP. Mitsubishi Chemicals launched an olefin (base) thermoplastic named as ZELAS. It is a high-performance thermal plastic with high rubber content. The product will have application in medical, automotive interiors and exterior parts well in construction materials. A wide range of stimulating expansions in material technologies were sprinkled in with some interesting declarations of new ventures in 2016. Regarding SABIC confirmed that it is assessing building a petrochemicals and derivative complex including polyolefins either in Texas or other in conjunction with an ExxonMobil Chemicals Co. affiliate. SABIC also announces that it will produce glass reinforced acetal for worldwide application in automotive, industrial and others by the end of this year. Moreover, it tends to increase the market size of thermoplastic polyolefins industry. Thermoplastic polyolefins are a part polymer family. Plastics are used in a wide variety of products and have replaced other materials such as wood, metal and glass. Global consumption of high performance plastics was 749 million metric tons in 2014. Increase in use of plastic as raw material well as final product tends to lift the thermoplastic polyolefins market. The global market for thermoplastic compounds should reach USD 633.7 billion during forecast timeframe from USD 506.85 billion in 2015. Increase in consumption of polymer products by end use industries like automotive while manufacturing automotive parts. It results good tensile strength, corrosion resistance and noise reduction when metal to metal contact incurred, in automotive parts. And it tends to boost the thermoplastic polyolefin market size. Thermoplastic polyolefins market is mainly driven by the growing demand for high performance and environment friendly material in construction and automotive industry. Additionally, the product is progressively being used instead of traditional thermoset rubbers and possess the capability to be entirely recycled.